Internet giant Google has recently been transferring its servers to Russia. Experts believe the company is planning to develop new services and attempt to seize a substantial part of the market from Russian search engine Yandex, its main competitor in the country. 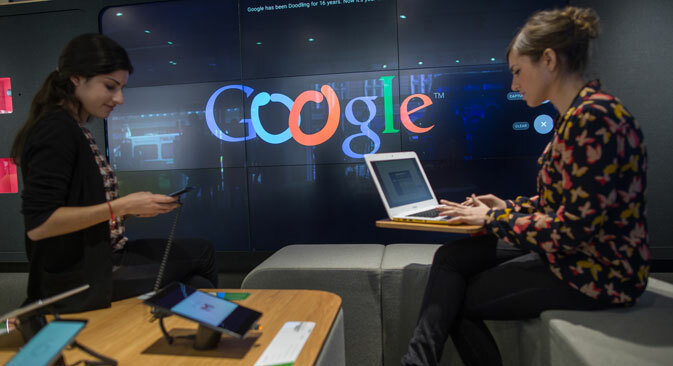 Google became one of the first foreign companies working in Russia to transfer the personal data of Russia citizens onto the country's territory. This is required by a new law that will take effect in September 2015. Recently, eBay’s chief officer in Russia, Vladimir Dolgov, announced that his company is ready to do the same. According to the RBC financial portal, Google began making arrangements to relocate its equipment to Russia more than a year ago and already has dozens of stands in several datacenters in the country. Financial portal RBC obtained a transcript of a meeting dedicated to the new law held at the Russian Ministry of Communications and Mass Media. General Director of StoreData Anton Platonov said during the meeting that it was revealed that Google already has dozens of stands in Russia-based datacenters. It appears that Google does not fully trust local datacenters. One participant in the meeting added that Google keeps its information on its company’s property, referred to as a "classified semi-state enterprise." In the participant’s words, Google does "not let anyone near its stands." Only the company's employees that come from abroad have access to the data. Another participant in the meeting confirmed that Google happens to be a client of several commercial datacenters in Russia, including TrustInfo. In the participant’s words, Google already rents a room from TrustInfo and is currently discussing the rental of another. Google's press office told RBTH that it would not comment on the transfer of data to Russia. Some analysts believe that the internet giant would like to avoid any confrontations with the authorities so as not to put its activity in the country in jeopardy. “The policy of the Russian government is pretty clear to everybody and nobody wants to be seen as the internet opposition,” said Alexei Lukatsky, an information business security consultant at Cisco. However, other experts suspect that Google is doing something else besides just trying to satisfy the new legislation requirements and that it’s up to something serious. The company could have met the demands of Russian legislation with much lower costs, says Karen Kazaryan, chief analyst of the Russian Association of Electronic Communications. "It is possible that they are planning to present new services in Russia and promote their cloud technologies more actively," explains Kazaryan. "No one knows what exactly they are transferring and why they are doing it," continues Kazaryan. He believes that the transfer of servers can be part of the company's development strategy and their desire to outdo Yandex, its main competitor on the Russian market. Lately, Google has strengthened its positions in the country, however, the market leader remains Yandex by a long margin. According to statistics provided by the Liveinternet.ru service, by the end of January 2015 Yandex's presence in Russia declined by 2.8 percent, to 58.9 percent, while Google's share rose by 5.9 percent, to 32.8 percent. According to information provided by TNS, a global market research firm, Yandex is significantly ahead of Google in Russia in terms of monthly users— 62 million compared to 49.4 million— however, these statistics do not include mobile phone users. Based on Morgan Stanley calculations published at the beginning of February 2015, Google is gradually becoming the leader in Russia for users of mobile devices and apps. The company has its own operational system for mobile phones, Android, which threatens Yandex's leadership in the future. In February 2015 Yandex appealed to the Federal Antimonopoly Service with a complaint against Google's actions concerning Android. Yandex stated that Google can force mobile device producers that install Android to refuse to preset its competitors' applications, signing exclusive contracts for the installation of its own products.